Yes, we do! MDI maintains a fleet of dump trucks and is able to deliver across the street or across the country. MDI also trucks capable of delivering palletized products and a crane truck that can deliver and place boulders. How do I calculate approximate tonnage needed? Measure the area to be covered in feet. Multiply the length by width, this will equal square footage. The square footage is then divided by coverage, this equals the tons needed. 1/4 to 1" rock covers 100sq. Ft. per ton - 2" Deep. 1" to 3" rock covers 80sq. Ft. per ton. 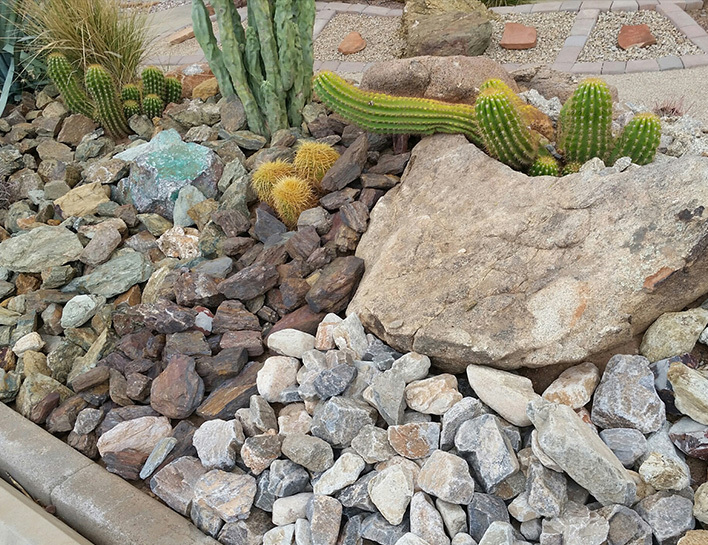 3" to 8" rock covers 60 sq. Ft. per ton. What do you mean by "grade"? All groundcover contains particles of the stone smaller than the size indicated all the way down to dust, these particles are referred to as "fines." There are different gradations of these products which determine the percentage of fines. The following terms describe the amount of fines in a particular product. Minus: A lot of fines, sometimes up to 80% of the product will be smaller than the size indicated. Screened: Some of the fines have been screened/sifted out. Typically screened rock will have 20-40% fines. Sized: Most of the smaller products have been removed, however can contain up to 15% fines. Washed: Products have been through a washing process to remove the fines and typically are very uniform in size.